Cafe Les Amoureux, Market Square, Sunnybank, Brisbane - my name is Food. When you spot a French dining place in an asian surrounded restaurants, you tend to overlook it.. Well, that's what I did.. However, I decided to go there and try it.. From the outside, you could easily set it apart from the other restaurants next to it since their restaurant's name is lightened up with lights at the front, and also the interior is filled with wooden seats and tables, with painted European influenced walls.. 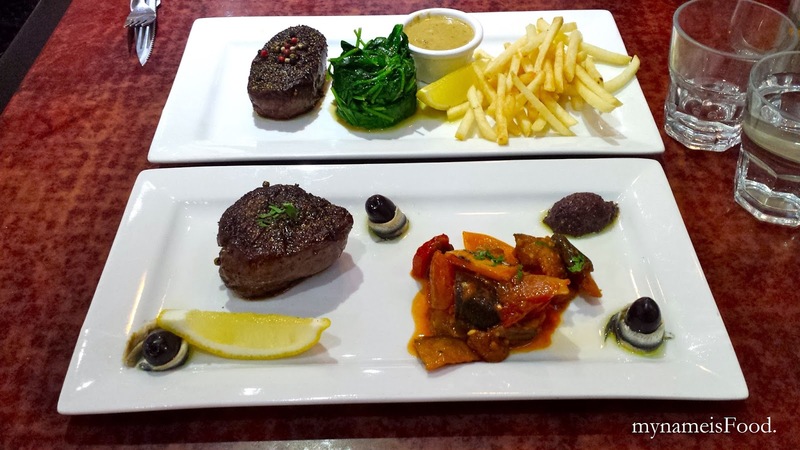 The restaurant serves the usual pasta, pizza, steaks, desserts, alcohol and coffee.. I heard that their steaks are recommended so we both decided to order their specialty steaks.. 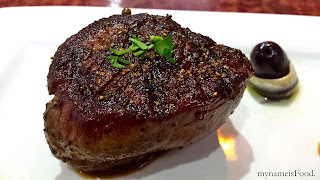 They have a variety of specialty steaks and also steaks where you could order along with various sides whilst the specialty steaks already comes with sides. 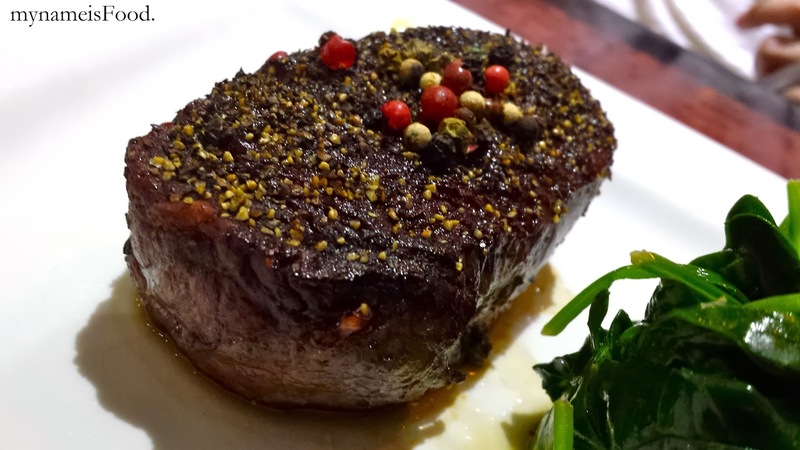 The specialty steaks can be chosen either as an eye fillet 200g or kobe cuisine striploin 200g marble score 6-9.. Firstly, the 'Provencale Steak' ($31) which is an eye fillet served with a tapenade sauce, olives, anchovies and ratatouille.. 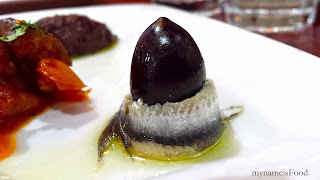 When the dish arrived, it looked quite simple and I thought that having anchovies and olives for a side was quite interesting which I was excited to try... 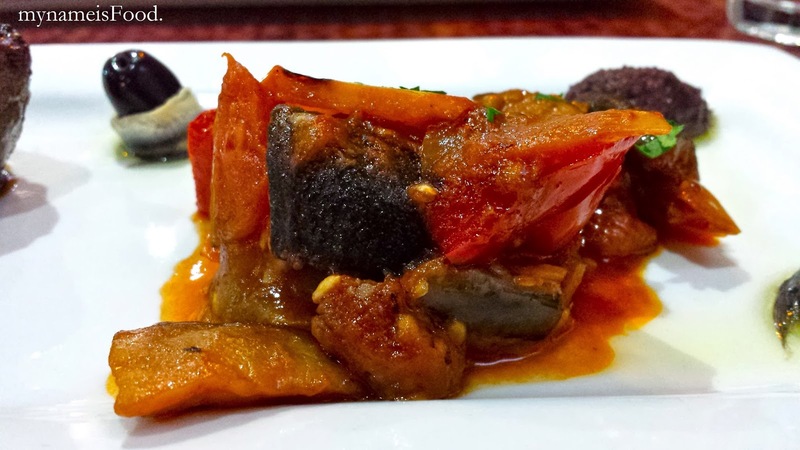 I wasn't sure how it would all connect and blend along with the ratatouille and the steak's taste and texture.. 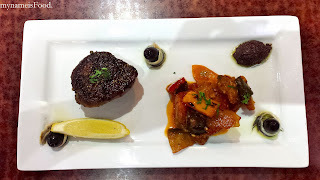 The steak looked a bit burnt but when cut through, it was quite soft and had a texture which I was expecting as I ordered it as medium-rare.. As for the ratatouille, it was not cubed nor was it round cut, but quite roughly cut.. However, the taste did remind me of the previous ratatouille that I have tried.. Although I tend to find the ratatouille quite soggy or so..
Secondly, 'Steak au Poivre' ($31) was also ordered in an eye fillet marinated with crushed peppercorns served with french fries, sauteed spinach and green peppercorn sauce.. A much simpler dish compared to the previous steak dish.. 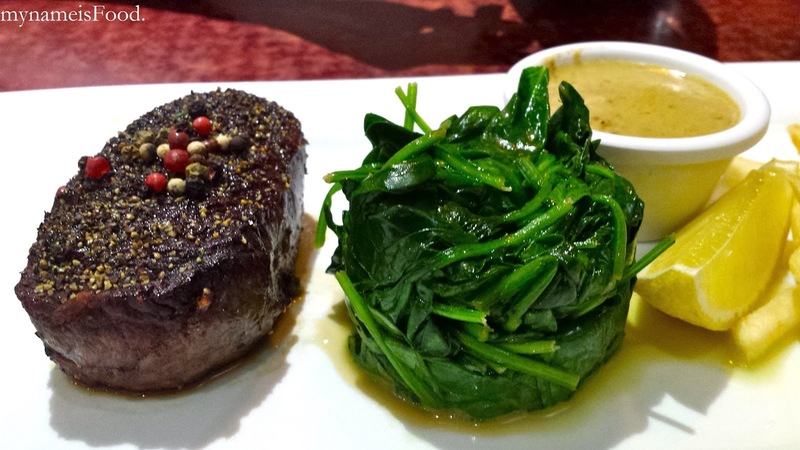 The marination and the peppercorn sauce was well balanced and quite strong.. 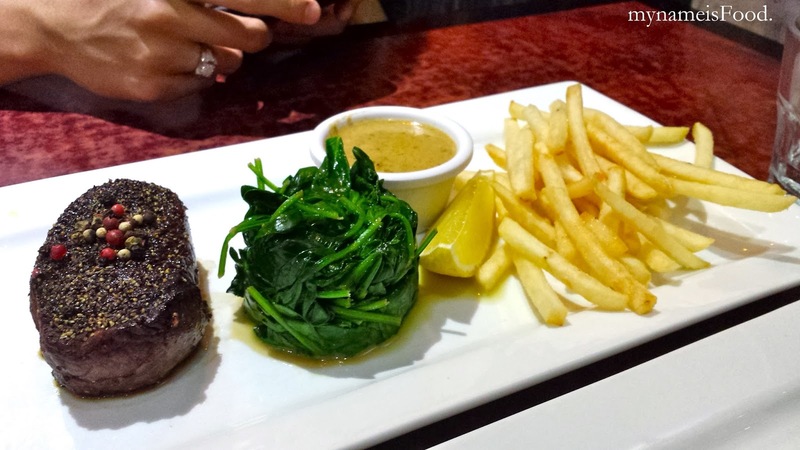 The french fries was quite normal and so was the sauteed spinach..